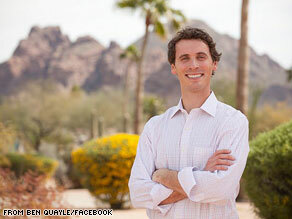 During the primary, Quayle – a young looking 33-year-old political newcomer – managed to raise more than a million dollars with the help of his father and former President George H.W. Bush. Quayle beat back accusations that his father was buying him the seat, and then complained he was being treated unfairly by the press. But with the nomination locked up, he seems to think its all just part of the political process. Asked by CNN if the press was unfair to him, Quayle said "I think the media is doing its job" then said with a smile "I thought that I had a very good level of scrutiny and I've taken it in stride." Quayle refused to answer local reporters' attempts to clarify what he may have written on a now defunct website called DirtyScottsdale.com. The site has since been renamed theDirty.com, but features similar content – gossip about nightlife in cities around the country. But he did respond to CNN's request to explain why, in his estimation, President Obama is worse than, say Ulysses S. Grant – whose presidency was marred by scandal. Quayle explained, "[W]ell we can quibble about the worst but if you look at the track record of what has happened in the last year and a half, fundamentally he [Obama] has taken over our country in a way that is frightening to a lot of people including myself." He went on to fault Congress and the President for excessive spending, passing health care reform and "apologizing for America." Quayle was joined at the event by his parents Marilyn and Dan Quayle. When CNN attempted to interview the former Vice President he said he's "feeling great" then walked on. Is this the only thing that the Republicans are capable of: bashing Pres. Obama. From an ex repubilcan. He is an idiot, just like his father! About eight words? Can't even get a straight sentence out about the number of words, he had to leave himself an out in case he was wrong. What qualifies Mr. Quayle to make such a bodacious statement? Was he paying attention to "W's" presidency? And what in the hell is in the water in AZ that drives them to vote for the likes of Jon Kyl, J.D. Hayworth & B. Quayle? If Mr. Quayle can spell potato, he must be qualified. What a joke! Posing with someone else's children so he could seem like a family man. Writing for theDirty.com. Quayle doesn't exactly occupy the high ground in his attacks. Will Arizona elect him? That would be sinking low. Yes! Another complete loser for the GOP! See, you can be elected by telling the truth. nobummer beats jimmy carter has the worst President in history. The apple doesn't fall far from the tree. Might you be a crab apple? What a idiot! He should review the american history! I forgot to mention that his dad was one of the dummest VP ever! This article is so biased against him. I agree he is kind of a jerk, but I do not find this article objective in the least bit. I guess it sells better than ethical journalism. Crash and burn mr. potato head!! I'm glad I don't have to vote for you. You need to re-visit your HISTORY because your ownfather the former US VICE PRESIDENT made a lot stupid and dumb statements during his time as a VP. if this don't scare the crap out of you nothing will. Idiots leading idiots. Wake up and vote democratic. This little weasel has a lot of b s with him as does the party he represents this none American approach of making statements such as is the hall mark of the party this mess was created by this no substance type that will use without saying of course the past down indifference that fuels division of a nation and want to take us back to the insane rambling that the sky is falling be honest and get facts America remember how we got here idiots as this think of us as nothing but the people on the other side of the tracks that can not think if fruit does not fall far from the tree remember the potato plant this weasel comes from or potato head more likely . As much as this boy lies, he'll fit right in with the DC crowd.